I am looking for a superking mattress. I am 5ft 1. 8 1/2 st husband is 6ft, 14 st. We are both front/side sleepers. Currently have an ergoflex memory foam mattress and both are overheating and I am waking frequently with lower back pain when I sleep on my front. Was going to try one of the bed in a box mattresses but came across your website and am now considering a more traditional pocket sprung mattress. What would you recommend from your range? The body weights you have provided dictate that you will need to opt for a dual tension of Soft and Medium. As you are both side sleepers that experience back pain I would recommend that you look at a mattress with a medium upholstery. 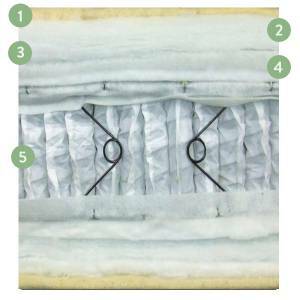 The Origins Pocket 1500 is our best selling made in the UK man made and natural fibre mattress. Offering a quality 1500 pocket-spring unit and layers of fillings for a medium overall feeling. Unbeatable value given its quality. The Origins Pocket range should be the most you pay for a polyester based mattress. If this falls within your maximum budget you can rest assured that there is not much more out there that compares. £620 for a King Size. This model comes with a 3 year guarantee. The Artisan Naturals is our most popular, unbeatable model with 85% natural fibres. Containing a huge GSM of fillings, including wool and mohair, on a Calico Pocket spring unit. This medium feel hand crafted mattress is where we stake our reputation as ‘The Mattress Specialists’. This is priced particularly low in comparison to more established brands in order for us to set the bar in comparing branded mattresses with similar components. If this is in the region of your maximum budget then you will be getting the best mattress you can buy. £1235 for a King Size. 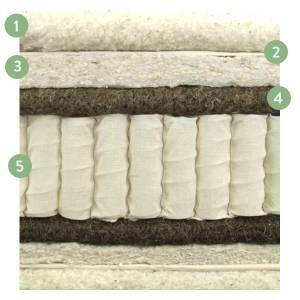 The Natural fibre content withing this mattress will make for a very cool sleep surface. This model comes with a 10 year guarantee.